Description: Lanyard Knots are frequently found in Macrame patterns, especially in plant hangers and holiday projects. They're considered vintage knots, since they were very popular in the early 1900's. These decorative knots are sometimes referred to as Crown Knots. They make beautiful woven patterns, and are easy to tie. 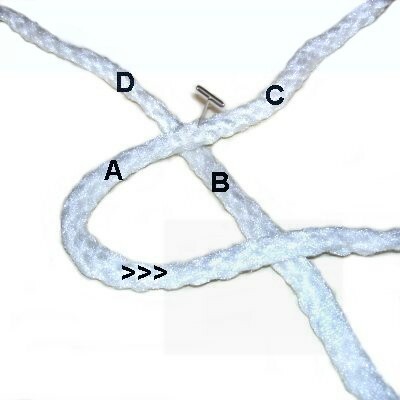 Kids will often learn this knot in youth activities, because they can be used to make bracelets, necklaces and belts. Try making a chain of these decorative knots to use as a purse handle, or to make a collar for your pet. Step 1: To practice a single Lanyard Knot, you need two cords at least 24 inches long. Lay the cords on your board and cross them to form an X shape. Match the centers and secure the cords. Move segment A to the right, so it rests on top of segment B. Makes sure there is room for a cord to pass through the curved area. Design Tip: Macrame patterns often require you to form Lanyard knots from cords that have already been in use. In that case, you would not cross the cords before folding them. But the remaining steps are the same. Step 2: Move segment B upward, to rest on top of segment C.
Step 3: Move segment C to the left, and position it so it rests on top of segment D.
Step 4: Move segment D downward to the curved area of segment A. Pass through the area, over - under the two parts of the curve, as shown. Pull on each end gradually to tighten the knot. 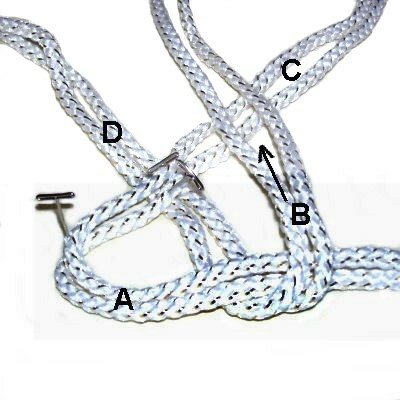 The process for tying Lanyard knots using multiple cords (more than 2) is the same as for the single knot. There is one change you need to make: It's important to fold the cords rather than curve them, particularly segments B - D.
The cords need to be neatly arranged, so shift their positions as you tighten the knots. They should not overlap. To make a spiral design, tie at least 5 knots. 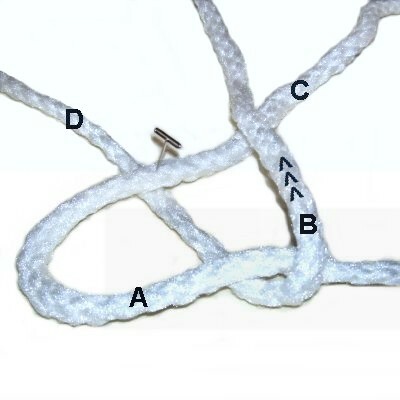 Be sure to tie each knot moving the same direction (counter-clockwise), as described in the instructions for the single knot. The knots will stack on top of one another. 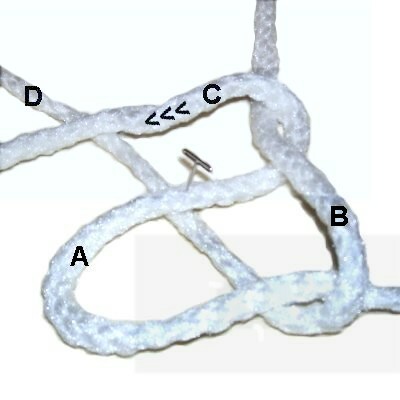 After you tie the first two knots, move the pin and secure the design on an angle, near the bottom. You can make a striped variation using two colors. One color is on the front and back, and the second color is on each side. This Candy Cane shows how the colors are separated. To make a striped design, all you need to do is alternate the direction you tie the Lanyard knots. So every other knot is tied in a clockwise direction. Be sure to keep track of the direction, or the pattern will not work out. 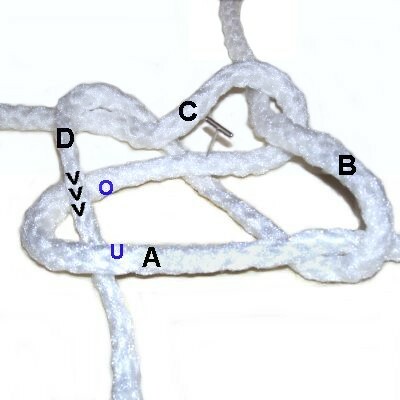 Lanyard Knots can be made with multiple cords arranged in a star pattern. The design forms a soft frame, so it can be used to encircle items like flat coins or beads. You need 4 cords to practice. Match the centers and secure them to your project board. Move each segment so it rests on top of the next one in line. It's best to curve the cords rather than fold them. Mark the space at the bend in segment 1 with a pin. Design Tip: Securing each end after it is used will help ensure you don't use the same cord twice. Pass segment 8 through the space near the bend in segment 1, where the pin is located. It should go through the space over - under. Have any comments about the Lanyard Knots? Contact Me.